How are you? Good? Good! There's something to make you feel even better: the new Weekday Escape! 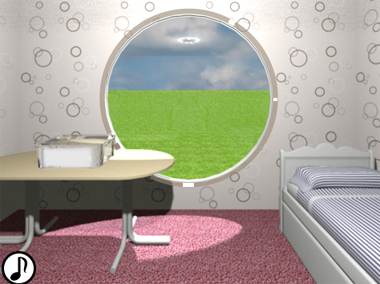 In Amajeto's game are hearts everywhere, according to its title; and to tell the truth, the place is overdecorated a bit...simple tomoLasiDo's room with amazing window may be a relief for some of us. It's seeming relief only. Little do brave escapists know, that another battle in the war between good and evil takes place in this cosy apartment! After you win it - and you will - you have to escape from Neat Escape's friend's house and short game by Minoto at the end brings a piece of nonsense poetry into your life. Amajeto doesn't need any introduction; they are around for more than seven years (until 2016 as Tomatea) and still doing well. Their games has considerably changed its appearance - their puzzles, on the other hand, haven't changed so much, they are clever and fun. You all know what to expect from Amajeto I think - and you will get it without doubt. The cursor is changing (its color), no save button, one ending. Big round window is tomoLasiDo's trademark, a room with fluffy carpet too, but look what you have in your inventory! A magic wand! It doesn't matter that it looks like a bottle opener, it can perform real magic accompanied by loads of little golden stars! You don't have to search rooms (yes, there is more than one room) for items, at hotspots just wave with you wand and voilà! Something happens for sure. Also, your wand is multipurpose - you can use it in non-magical ways too, it's not fragile.The game's goal is simple - you have to collect eight mini wands and get out. It seems easy...but is it? Another Neat Escape's friend invites you to his house - and again, nobody's inside the house and you find only a note 'Let's escape!'. 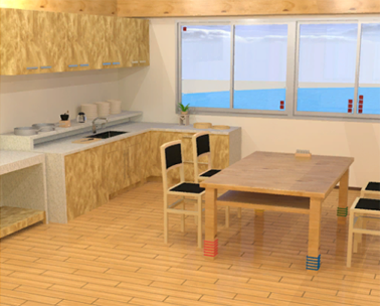 All designer's friends have suprisingly similar taste or keep hiring the same interior designer who doesn't believe in individuality, so the room feels very familiar - polished wooden floor (pine maybe), simple furniture design, soft yellow lighting and large windows with marvellous view. Some spots seem like hotspots and they are not, some real hotspots are hidden a bit, but no pixelhunting - in general we got solid and fluent escape game. The last game in this WE is from whimsical and humorous Minoto's world and informs about love life of mice, working habits of the Sun and social life of snowmen. Any questions? I'm sorry, I'm not able to explain...but what I do know is that the game is lovely. P.S. Some more games for Valentine's Day: Monkey GO Happy Hearts and Monkey GO Happy Valentines by Monkey GO Happy. Fragments are those little pink rod thingies. Don't drink milk while playing this if you know German. Click above the brown whoopee cushion on the bed. Use the wand to nudge the fragment out of the gap. Collect the fragment near the door. WARNING: At the time of writing, if you don't get this fragment before you open the door, you won't be able to get this fragment. Please restart the game. Your precious fingers can't touch the dirty bin, so use the wand to tip it over and collect the fragment. Use the wand to hit the whoopee cushion on the bed. Notice the left-right pattern. There is some markings on the large round window. Note it. This clue refers to the clock. Throw the wand to knock it down. Use the wand to prop up the left hand side of the table. Use the wand on the plant. Notice how many fruits there are. Clean the ink on the picture with the wand. This clue again refers to the clock. Add up the numbers. The clue is the round windows of each room. Boss fight occurs near the cabinet with two drawers. If you can't open the white screen, that means you are a cheater. Make sure you have used the wand eight times. After the first fight, your wand will break. Fix it by using the eight fragments on the toilet. After the boss is dead, the main key should be complete. You may escape now. Or fix the wand using the white crystal, on the toilet again. A colored dot will appear on each white bead. You may escape now for the second ending. Well that one puzzle in here was rather arbitrary! 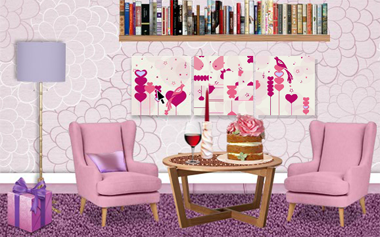 The room is decorated in various shades of pink and violet. You can examine the pictures on the wall, the middle one of which is scrambled. Turn right to face a locked balcony door and a four-letter cupboard above which hangs a picture covered in lots of love. But something's unusual about it. Turn right to face a television, currently turned off. Beneath it, there's a grid on the left that you can't use yet, and a golden square tile on the right. Turn right to face a bunch of cabinets. The ones across the top are all unlocked and hide a letter behind except for the middle one. There's a cutesy picture in the middle which has tilty corners. The ones below have a 2-button lock, 4x4 grid lock, nothing at all, a four-button lock where each button extends a bar, and a four-digit lock. Let's start with the classic. Restore the randomized scrambled image by rotating its pieces. When it's done, the right picture slides over so you can take a square tile. Take a closer look at those left and right pictures. Chains of heart balloons (or so it appears) float up, but they're not all the same. Use that clue to unlock the middle-right cupboard. Four of the hearts (across the left and right pictures) are marked with smaller white hearts, and each occurs on a chain of 4. The marked hearts are in the 4th, 1st, 3rd, 2nd position from the bottom, so click the buttons 3, 0, 2, 1 times so the bar lengths match. Then open the safe to get a silver key. The key unlocks the balcony door. This time, it opens up to a snowy forest. Push aside the flowerpots to find a square tile. It also helps you see the next clue better. Use the clue from the balcony to unlock the tilty corner picture. The darkened small squares on each square grid in the balcony occur in the upper-right, lower-right, upper-left, lower-left and lower-right corners. So click the ⌝⌟ ⌜⌞⌟ corners of the picture to unlock it, or rather the cupboard above it which has a letter A and a square tile. Use the clue from the Love picture to unlock the lower-left cupboard. White dots appear in two columns (vertical strokes (stems) on L and E), on the LRRRL sides. So push those buttons, then unlock the door and get the remote control inside. Use a clue from the TV to unlock the bottom-right cupboard. The green digits on the TV are the channel numbers, which go from 2 to 3 to 5 to 4. Enter that in the lock and open the cupboard door to get the square tile. Use another clue from the TV to unlock the safe beside the balcony. The clue with numbered squares tells you to take the last, second, third, fourth letters from the top row of cupboards. Those letters spell TEAR, so enter that in the safe and open it to get another square tile. Use the last clue from the TV to unlock the remaining (middle-left) cupboard door. Exactly four cupcakes have LOVE written on them, and they are in the middle positions on the top row and the outer positions on the bottom row. Click those squares, then open the door to find the last square tile. Use all seven square tiles on the grid under the TV, and unscramble the image there (also randomized) to unlock the compartment beneath. Take the gold key and escape! a pair of clips, a pencil lead, a map (used), a box needing a 3-symbol combination, and a bottle and lid. to put water from the sink into the bottle, but that doesn't work. I also tried to connect the pencil lead to the clamps, to attach the clamps to the wires in the box with the four batteries on top, or to place the pencil lead in the clamps in that box or in the clamps on the device by the window. None of that worked. I've also tried to use the red-square clue from the windows to open the drawer with the four "corner shape" buttons. I thought this would mean I should press the shapes corresponding to "upper left, lower right, lower right, lower left", but that didn't work. I'm losing my touch! Thanks, molsen14! I missed that. it says to use your wand on the object on the bed to open the door to get fragment, but I did that 10 times and door doesn.t open, no fragment. it says "fragment too high up"? i don't see one too high up. please help. box with dice painted on it? huh? Take the box in the upper drawer. Take the battery behind the plant on the M-shaped stand. Take the battery inside the coffee grinder. Note the colored rings under the dining table. Note the red squares on the window. In front of the bookcase there is a pen holder. Take the mechanical pencil inside. Press on the pencil to retrieve the lead inside. Note the picture depicting a jar with electrical wires. Left of the picture, there is a window with six red squares on it, which is so faint that many people don't notice it. Click to see the clue more clearly. Take the bottle under the E-shaped table. Remove its lid. Take the battery behind a cushion on the sofa. Take the piece of paper behind the picture of a beach. Notice the H-shaped table and the device on it. It is the clue to the right cabinet under the three stars. Lower-left button, upper-right button, upper-right button, upper-left button, lower-left button, and lower-right button. Over the windows above the bookcase, use the telescope to look at the yachts. There are symbols painted on the yachts. Use the clue to unlock the locked box in your inventory. The sun symbol, the white flower with eight petals, and the star with eight dots surrounding it. Take the ice pick inside the box. Punch holes on the bottle lid with it. Wet the paper with the faucet near the dining table. Use the clue to open the left cabinet. The clue refers to the shape of the tables with plants. The answer to this puzzle is HOME. Stick the wires through the bottle lid. Use the pencil lead on the wires. Put the whole thing back into the bottle. Unlock the device using the clue from the dining table. Connect the bottle with the device. On the top of the device, there is a place to set down batteries. Put in the batteries. Turn the device on and look at the bottle. Use this clue to open the lower drawer near the dining table. Take the key inside the drawer and use it to open the door. No whimsical walkthrough this time, just a simple one. With a small letter "i" of course. 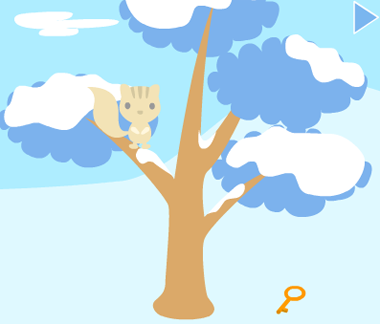 A squirrel sits on a tree as you pick up an ordinary key from the snow-covered ground. Go right to a house with two snowmen outside and a metallic handle on the ground. The door of the house is blocked by a ladder, so click the ladder to set it upright. Then open the door with the key, and a lion wearing a gray cap comes out and climbs up the roof when you click him. A red portable stove sits on the left table without any gas in it. Pick up the pan (that conducts heat well, of course) hanging on the wall, then pick up the red thread that falls from the hook. The fridge is missing one door handle, so use the one you picked up outside to open it and find a gas can. Go right to find mice balancing on color pencils, two of which already have red loops on them. There's also a plant pot on the right and a shovel on the left. Tie the red thread between the pencils so the mice can meet. They drop a red heart which pops upon hitting the floor, leaving behind a metal heart mould. There's no hole to dig, to give the shovel to the lion instead. All the snow falls on the ground, but there's still a tough walnut left on the roof. Give the walnut to the squirrel, who does its thing, and then drops it on the ground where it cracks open. Pick up the mysterious seed from inside. Go back to the mice, and place the seed in the plant pot. Out pops an orange flower with a bar of confectionery chocolate inside. Put the gas in the stove, and put the pan on it, and then add the chocolate. Immediately pick up the bowl of melted chocolate, and use it on the mould (or vice versa). Then pull the chocolate heart out. Who do you give it to? Give the heart to either the mice or the snowmen to end the game.